Would you like the opportunity to showcase your soapmaking skills and a chance to enjoy soap made by fellow soapmakers in our rockstar soaping community? Yes? Then enter the Bramble Berry Soap Swap- it’s not to late! Read the rules here and send us 12 bars of soap by Monday, May 2nd! Make sure to email us at swap(at)brambleberry(dot)com and tell us if you’ll be submitting melt and pour or cold process and which fabulous Bramble Berry fragrance you’ll be using. 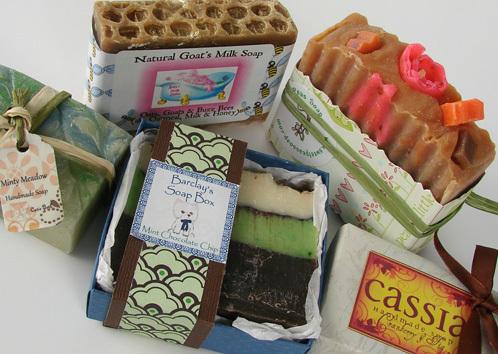 Beautiful soaps from the last soap swap. If you need some inspiration, see pictures from our last soap swap in here and check out the swap line-up thus far! We already have 74 people signed up for the cold process group and 49 peopled signed up for the melt and pour group. I can’t believe we have 123 participants already. EEEK! Oh my gosh I received my swap package. 22 soaps! They smell delightful and I can barely wait to dig into them! Anne-Marie thank you for hosting this swap for us! I love the little sock sleeves the soaps arrived in! Darling and practical! OK off the peak at the bunch! Thank YOU for participating! It’s a fun project for the BB staff too. We love sniffing and looking at all of the soap coming in! Until next swap, happy soaping! I’ll be sending my submission next week. I was just wanted to know when the shipping box option to receive my swap soaps will be available on the website. I was just making my soap for the soap swap and….VOLCANO!!!!! I hope I can salvage it. Quite the night. I made Kentish Rain for my CP soap! Can’t wait to see what everyone did! 😀 just received my f/o’s and e/o’s…. now im working on the blend and will soon get my other supplies!!! im excited to do this for the first time! We’re excited to have you! Make sure to email [email protected] (dot com and tell Amber what your blend is if you haven’t already. And thank you for your business. Ooooh look at that mint chocolate chip soap! I want! i signed up for the swap and decided that mine is cucumber melon cp.. just to update you.